It is not like I didn’t know what I was getting into. I had been warned. Online message boards, guidebooks, Disney’s own websites, even their own Guest Relations people had told me repeatedly – July 4th was crazy. 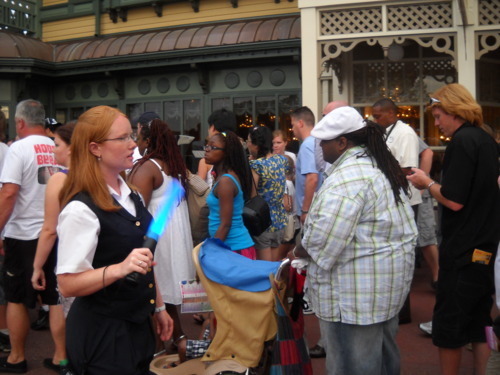 It is the second busiest day at the Magic Kingdom (exceeded only by Christmas Day itself). Wall-to-wall people, hot, humid, ill-tempered, unhappy, to be avoided. To me, this talk was counter-intuitive. If the place was so miserable, why would everyone want to be there? Besides, if anyone knew how to put on a fireworks display for the 4th of July, it had to be a place where they put on a great firework show daily. So, despite my own reluctance for crowded situations, I decided to jump in. 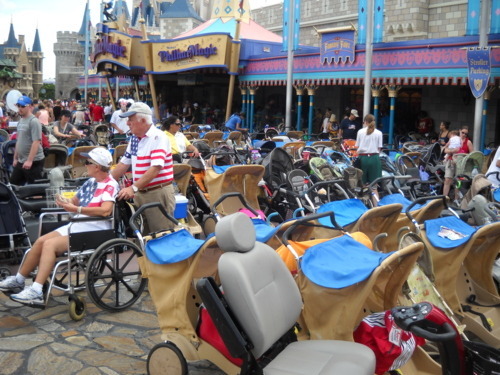 They opened the Magic Kingdom for extended hours – 8 a.m. until 1 a.m. Every extra castmember possible was brought in, contingency plans were made, supplies were laid in, all in anticipation of dealing with one of the most massive crowds of the year. While I arrived relatively early, I was already parked in one of the remote parking areas. Arriving at the TTC, though, let me know my previous research there (including being detained by security) was worth it. While there were substantial waiting lines for both the express monorail and the ferryboats, the local resort monorail line was empty – I walked straight onto the train, and six minutes later, straight into the park. My plan for the day was simple. I had one goal – to get the best possible shots of the fireworks program. I wanted to avoid, as much as possible, heavy lines for the rest of the day, even if that meant visiting some lesser known attractions. My rule was any line longer than 30 minutes was off-limits. I also knew I would have to get in position early for the fireworks show. I figured that 7 p.m. would be plenty of time. My first task of the day was scouting out where to take pictures of the fireworks. I decided that the platform of the train station would afford me a great location if I could set up in time. I checked out the spot and lined up the shot in advance. Perfect! It’ll frame everything wonderfully. But looking at the picture, something was tickling at my brain. Something is missing here. Sort of frustrating, like looking at an “I, Spy” book and knowing something’s there, but it just keeps eluding you. I decided to make a note and put it on the back burner for another visit. If I come back again and that feeling is still there, I’ll pursue it further. But I had a different agenda. I spent most of the day wandering around the periphery of the park. The closure of what had been Mickey’s Toon Town station on the Disneyland Railroad for the new Fantasyland expansion was now regrettable, as it meant that there was no quick way to avoid the crowds in the park to move from one side to the other – you had to wade through them – or instead, what they leave behind. After the 3 p.m. showing of the Celebrate a Dream Come True Parade, I decided to check out my preferred shooting spot. I was right, it was good – because it was already occupied. The entire Main Street train station platform was a solid line of people along the rails. And not just any people – grandparents! Yes, the ones willing to sit and wait and hold the spaces for their more active children and grandchildren, to just sit there for six to eight hours for the great seats, while their family members kept them supplied with food and beverage. Obviously, time for plan B. The problem though was this – the camera I own doesn’t have a genuinely manual mode – just a series of settings for different events. One of these is, in fact, “Fireworks,” which includes a lowered ISO setting and a longer open shutter time. Because of this, the image is susceptible to ANY movement – even the gentle shaking of my hands due to a heartbeat, or shifting my weight from one side to another. Any of that ruins the shot – as other nights taking pictures for practice had shown me. But Best Buy didn’t have that brand, they had the “Dynex” knock-off, made in China. Same price, but as I found out, not as good. So now, I’m looking for a place to set up my camera that (a) either has a flat surface or something a weak-grip tripod will work with; and (b) will have somewhat of an open space in front of it, to minimize the shots being blocked by other people watching the show. 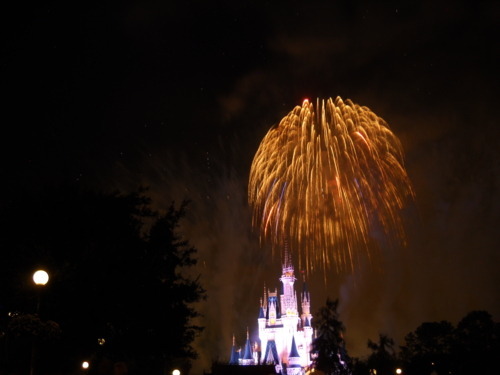 Right – open space at ground level in the midst of 100,000 people on the 4th of July, with a clear view of Cinderella’s Castle. Where could you find that? 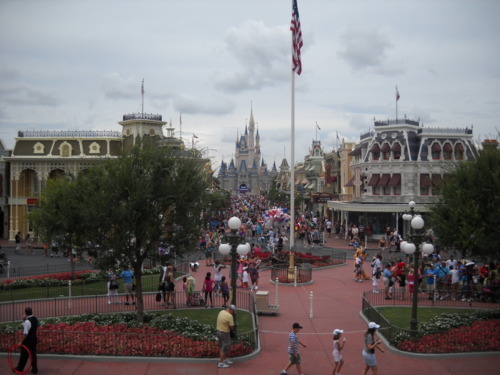 1) On Town Square on Main Street USA, the central square has a set of grassy areas set off by wrought iron fences. If you go to the ones closest to the train station, the view from the railing to the castle is a unique angle (I may shoot from there some other time). As long as people aren’t leaning in from the side, the next closest person is 12 feet in front of you, and should not be obstructing your shot too severely at that angle. 2) Just off the Central Plaza, on the way to Tomorrowland is the Plaza Rose Garden. There is a PhotoPass spot right at the archway, but further down the path is a place looking at the castle. I’d typically say overlooking, but you’re not – you’re about 15 feet lower than the surrounding ground. I’m looking forward to trying this on another night as well. 3) Also in the Central Plaza area, there is a path between Tomorrowland and Main Street that runs behind the popcorn cart. This path includes a pair of “cut-out” areas, where you could stand aside to let others pass. Either of those would work, as there is nothing but a lawn in front of you for a good 10 yards. All of those were good… but as I was scoping, I found my Plan B. Directly in front of the Plaza Restaurant, alongside a fence, was a trash container! An honest to goodness, flat on the top, hinged openings on two sides trash container. It was as if the sun had broken through the clouds at a perfectly artistic 40-degree angle and shone upon this thing. I was over to it in a flash, had my tripod out and set up, and started to line up the shots. Soon, I was ready to go. So I looked at my watch – 5:45 p.m. I had three hours and fifteen minutes to wait, guard, and protect that spot. I found myself wishing for either some grandparents or some grandchildren at right that moment. When I’ve been to Independence Day events in the past, my experience is that the folks you meet will probably be from the community. In Lake Stevens or Everett back in Washington, it was folks from those towns. In the Navy, it was other servicemembers and their families. Even at larger city celebrations, it would usually still be people from within a certain distance radius – even when I attended one July 4th concert on the steps of the US Capitol in Washington D.C. In my experience, Sweden is just a little bit outside of my usual neighborhood. But the first family to set up and save a spot near me on the sidewalk there was in fact from Sweden and spoke nine words of English. Luckily, two of them were “air conditioning,” so I was able to show them where to go for a nice cooling time waiting in line before the show. – The Seales family from Rhode Island, This included Steve, who worked in extruded plastics and discussed some of the more incredible projects he’d been involved with – one story involving an in-ground tank that had to be sunk by a certain time or thermal expansion would have caused a mis-fit and a potential major catastrophe. His wife Laurie and daughter Jessica were also there and quite charming. 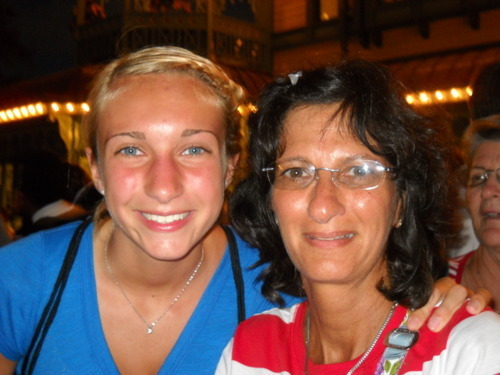 Jessica was headed off to college but wants to come down to Disney World as a college intern someday. – Natasha and her mom, Tsuey Ing (and my apology if I misspelled that – DGS), locals from Florida, here to enjoy the show, with Mom showing that her iPhone 4 took better pictures and videos than my four-year-old Nikon Coolpix (why am I not surprised), but also sharing some great tips about the parks themselves and past holidays here. 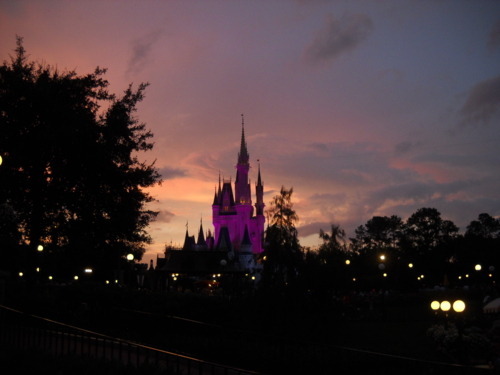 Most of my time was spent with a family from Wisconsin – Brian, Tara, Myles, Tyberius, and Linda – three generations sharing a ten-day summer trip to Walt Disney World. The following day was their last, so this was their big send-off. Linda, being the grandmother, was the placeholder, guarding their spot along the fence like a hawk. We swapped stories and talked about kids and life and things. What was so fun was watching Brian and Tara with their sons, trying to be adults about the whole Disney experience when, on the inside, you could tell there was a ten-year-old waiting inside each of them, itching to have just as much fun. I really loved the look on their faces when the two of them came back from riding Space Mountain. Young Myles was a collector – he was busy working on his pressed penny, pressed quarter and (a surprise to me) pressed dime collection – priceless souvenirs that will become time machines, instantly transporting him in his mind to the first moment he held that object. His brother, Ty (short for Tyberius – a very cool name, I might add), was feeling the ill effects of a long trip and spent the evening quiet and close to his grandmother. 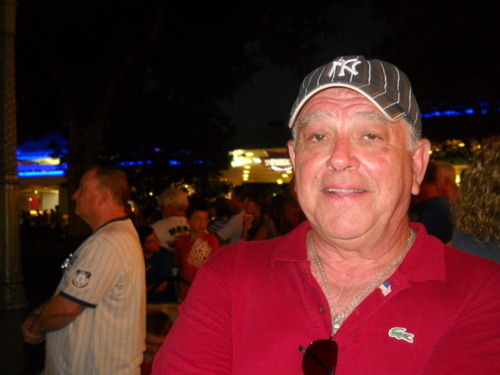 I was having so much fun talking to them that it wasn’t until after I returned home that I realized I had neglected to get either a photo or contact information for the family. A shame, really, because I wanted to remember them better. Behind us, the crowds became thicker, turning the walkway between where we were stood as a group and the Plaza Restaurant into a river of people. The sheer number of people moving through were incredible to contemplate, because they just kept coming, seemingly without end. Castmembers managed the flow, temporary signs appearing to direct people to follow this path or that toward their destinations. Around 7:15 p.m. the sky became grey, and there was a flash of lightning and rumble of thunder in the distance. But the rain, which threatened briefly, never materialized. When the clouds did break apart, it was in time for sunset, allowing for some incredible pictures with Cinderella’s Castle as a backdrop. Ten minutes before the scheduled start, the speakers around the park come to life with the sounds of an Aaron Copeland piece, something that is now considered quintessentially American. The announcer’s voice reminds us that the lights would be dimmed and that the fireworks could be seen from anywhere in the park. Sure, I thought. But will they be framed as nicely against the castle there, as they were originally designed to be seen? True to their words, as the last traces of twilight are starting to fade from the sky, a loud drumbeat comes over the speakers, timed precisely with the lights going out. The crowd goes wild. A second beat and the castle turns green. As the first fireworks go off, my finger hits the button, and I wait the three seconds to see if my waiting, set up, prep have been worth it. When the image appears on the back of the camera, I let out a loud whoop! I clicked away happily over the next 15 minutes, capturing everything I could, until the grand finale, when they ringed the park with fireworks and almost literally turned night into day. Even my camera couldn’t do that moment justice – too much light turned that picture into a complete whiteout. The last shell had gone off, the final firework was drifting away to ash just as they switched on the lights in the park. 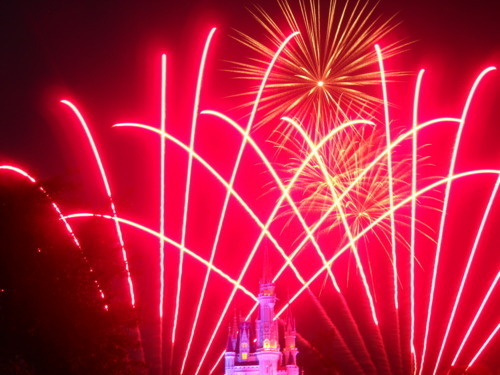 In that one moment, the last notes of music echoed away into silence for a brief second – and then a new wall of sound, this one from the cheering crowds, who know that on this Independence Day, Disney really did celebrate America in style. As I started to put things away, said goodbye to everyone and made my way with the crowds out of the park, I noticed that the ferries were delayed in getting underway. 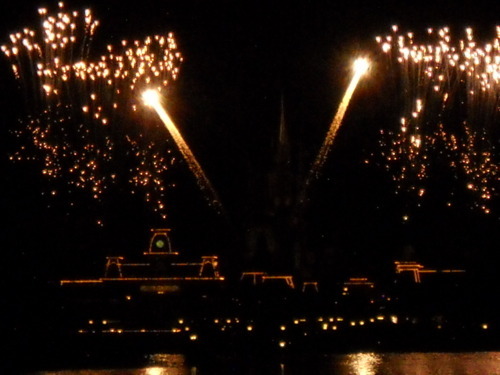 I later learned they had been docked during the fireworks because the exact set of shells was also fired simultaneously over a pair of islands on the Seven Seas Lagoon. 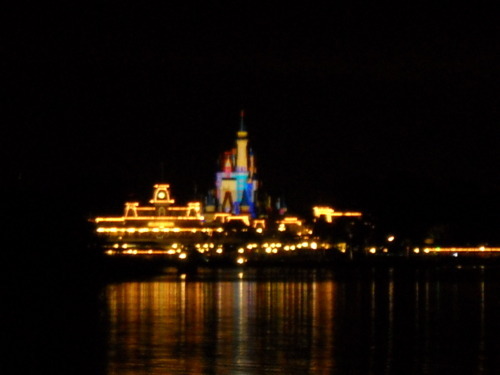 Thus, you could have been anywhere around that lagoon, even with your back to the castle, and still seen and enjoyed the show. As I waited with the crowd to board the ferry, the Water Electrical Parade moved into position nearby, a series of electrified signs showing sea creatures with music that gets towed from location to location around the lagoon and Bay Lake. As we boarded and got underway, it switched to a patriotic theme, befitting the holiday. I hung back as everyone else disembarked the ferry at the TTC, so I was one of the last people to depart. As I left a single family of three boarded for what I knew from experience was a very cool moment – being chauffeured somewhere by Disney Transportation. I leaned against the side of the concrete ramp back up to the TTC and watched the ferry depart. As I turned away and headed off toward the parking lot, I smiled to myself and thought, Some nights, there are just going to be fireworks.